This post shows you 37 different Google My Business post examples. Posting consistently on Google My Business has been shown to improve search rankings. However, Google My Business posts are still relatively new, so some people need a little inspiration. Let’s take a look at how different businesses are using GMB posts with Google My Business post examples. 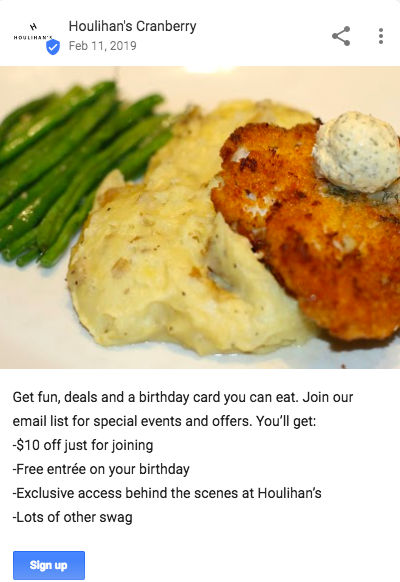 This restaurant is using a Google My Business post to promote their email list, using a Sign Up Call-To-Action button. 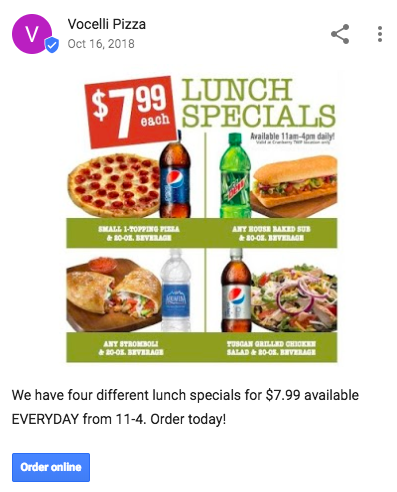 This pizza place is promoting a daily special using the Order online CTA button. 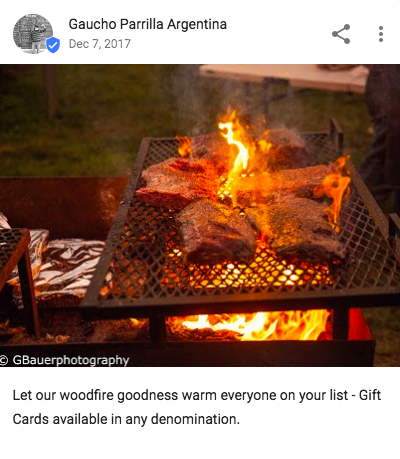 This Google My Business post example is a restaurant is showing off how their food is prepared. 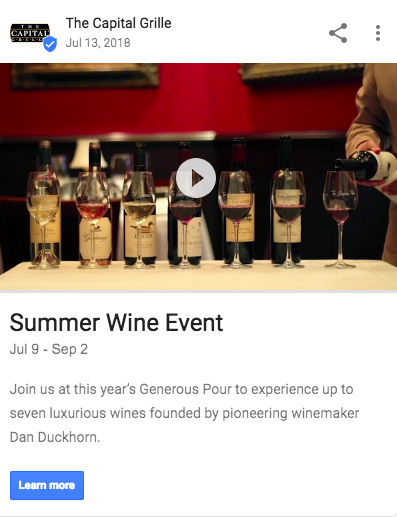 This restaurant is promoting a wine event with an Event post and a Learn more CTA button. 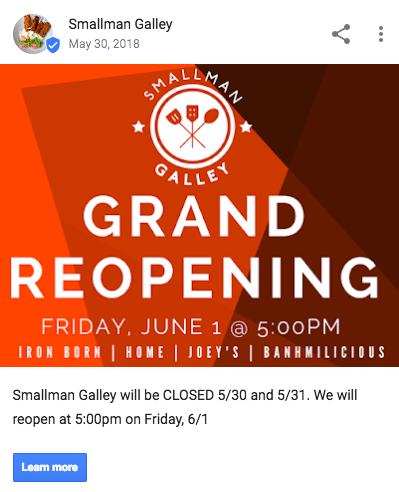 This restaurant used a Google My Business post to announce that they will be closed. 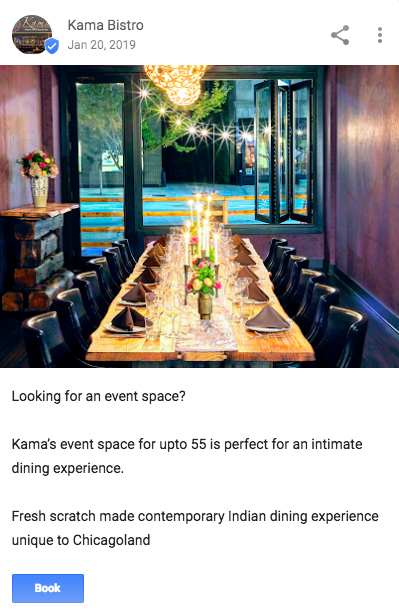 This restaurant used a GMB post to promote their event space. 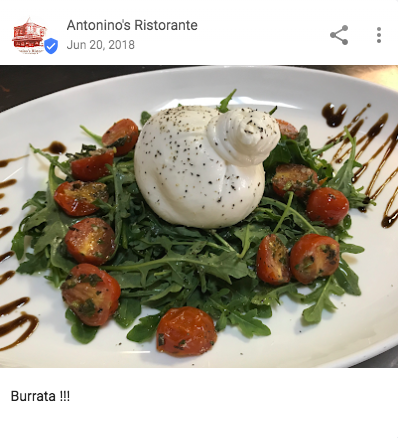 This restaurant is using a GMB post to show off one of their dishes. 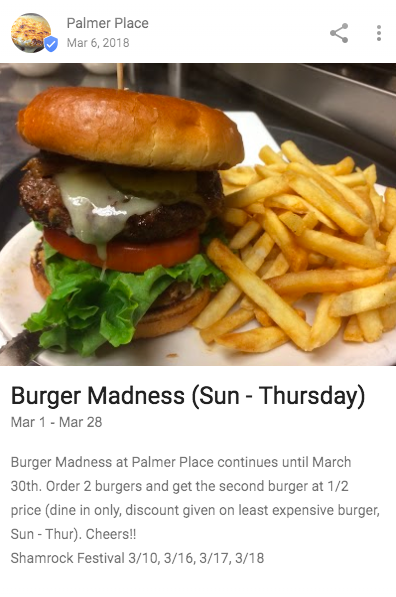 This restaurant used a Google My Business post to promote a BOGO half-off special. 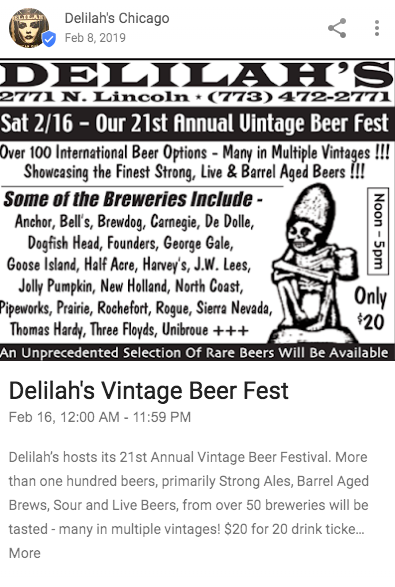 This bar used a Google My Business post to advertise an upcoming beer fest. 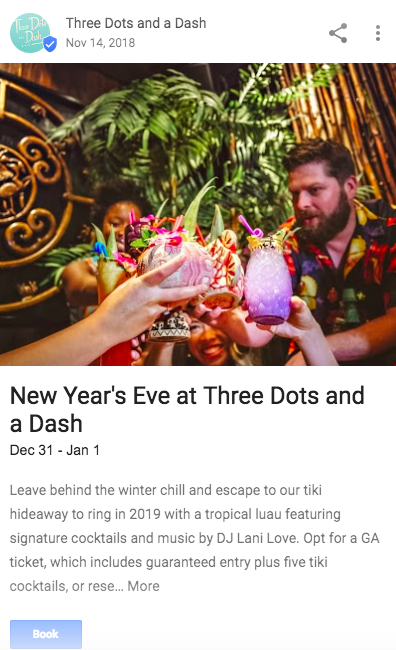 This bar used a Google My Business post to promote a New Year’s Eve event. 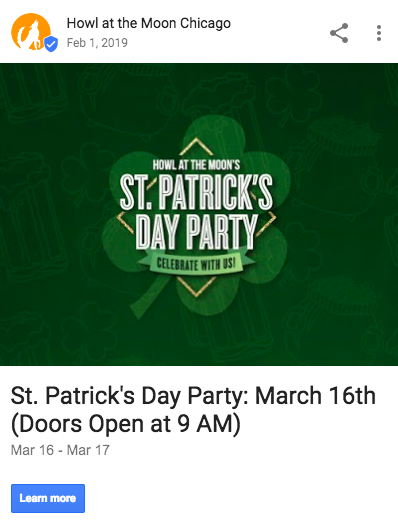 This bar is using a GMB post with a Learn more CTA button to promote their St. Patty’s day event. 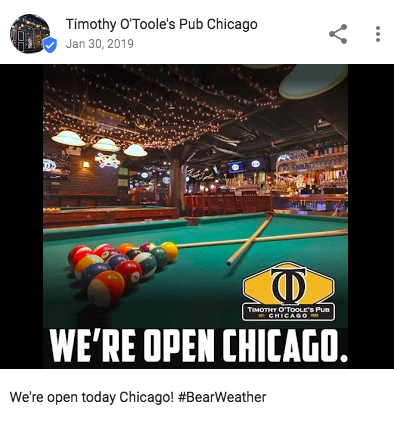 This bar used a Google My Business post to let people know that they were still open despite the bad weather at the time. 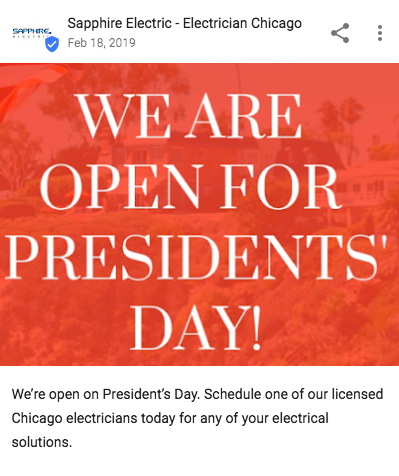 This electrician used a Google My Business post to let people know that they were open on Presidents days. 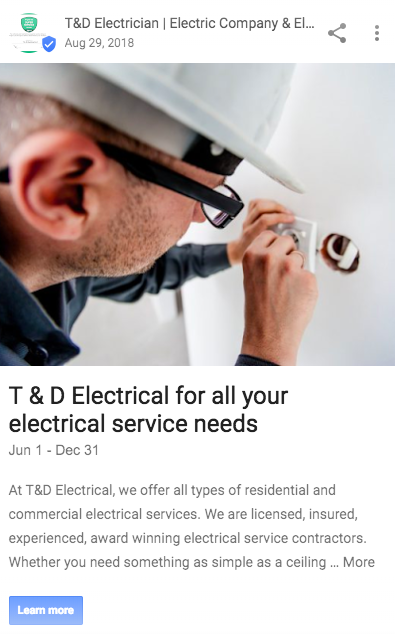 This electrician promoted their services and qualifications in a GMB post with a Learn more CTA button. This is a Google My Business post example of a shop that simply promote themselves. This auto shop used a GMB event post to promote free body estimates. 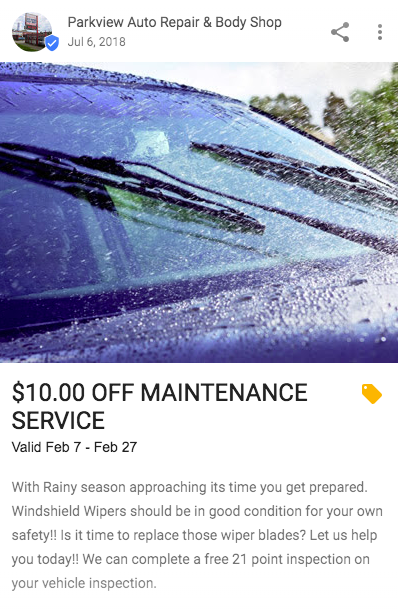 This auto shop used a Google My Business post to offer a $10 off coupon. 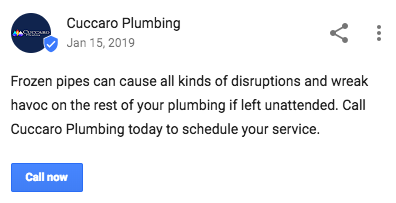 This plumbing company used a Google My Business post to build trust with potential customers. 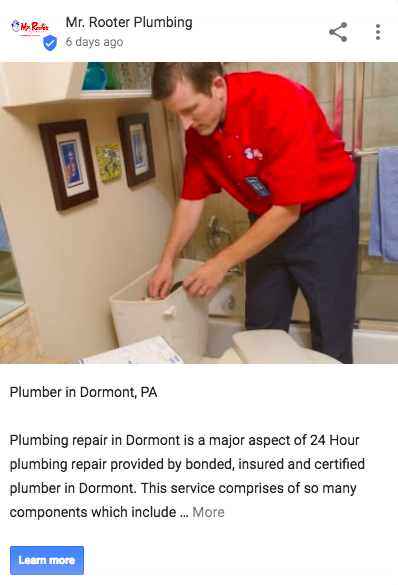 This plumbing company used a Call now CTA button in the GMB post. 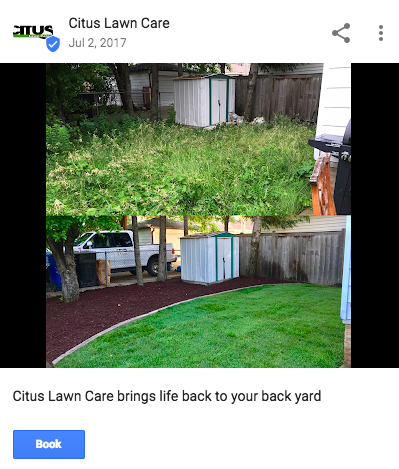 This lawn care company used a Google My Business post with a Book CTA button to showcase past work they have done for a client. 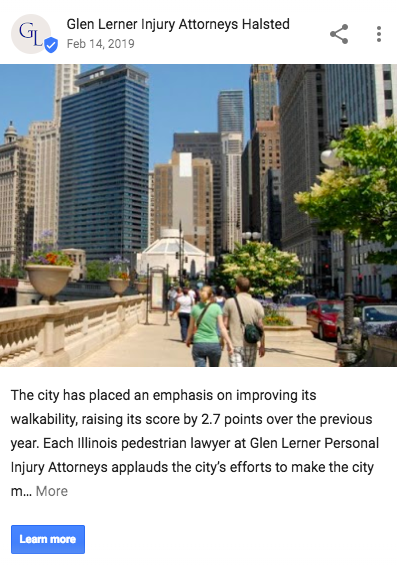 This law firm is using a Google My Business post with a Learn More CTA button to advertise a specific niche that they work in. 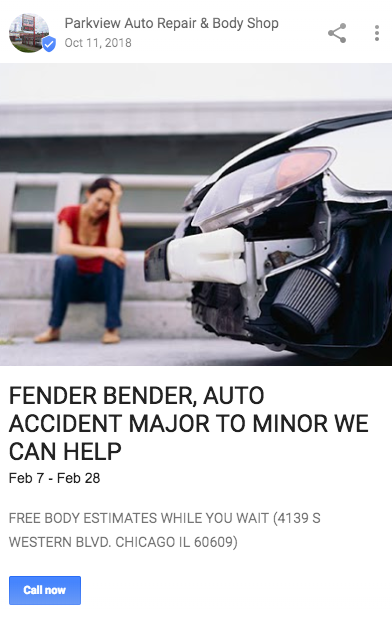 This law firm is sharing a link to a recent blog post in a GMB post. 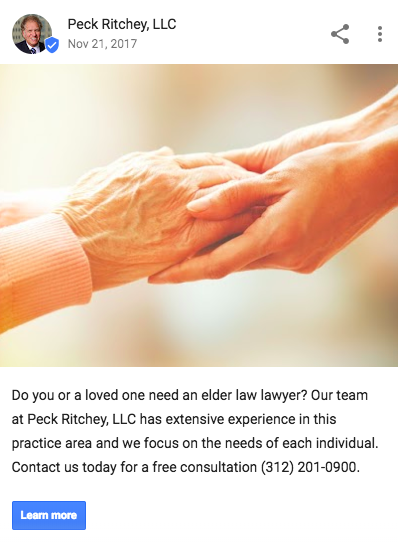 This lawyer is using a GMB post to showcase his work in elder law. 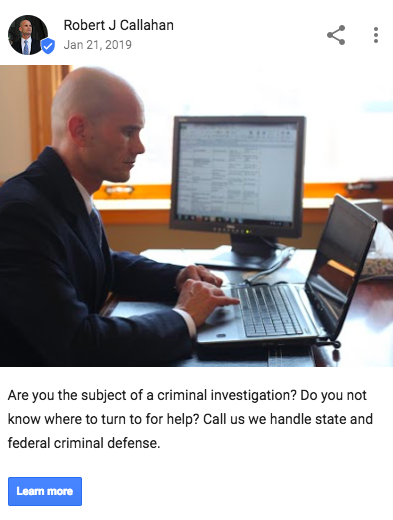 This attorney is using a GMB post to showcase his work in criminal defense. 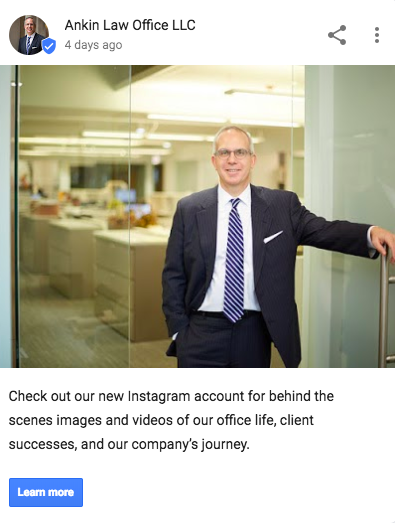 This law firm is using a Google My Business post to market their Instagram account. 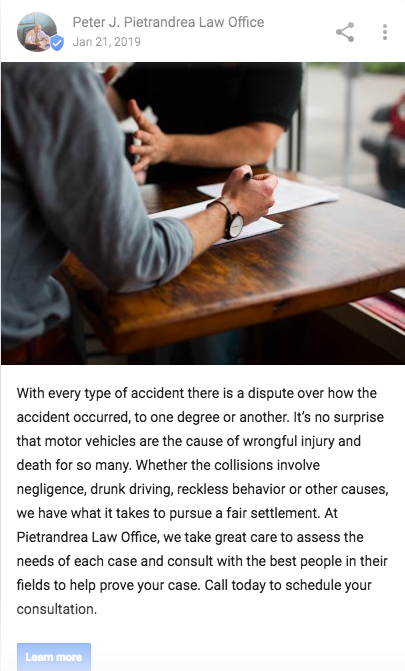 This law firm is using a GMB post with a Call Now CTA button to showcase their expertise in accident injury. This attorney used a GMB post to simply say happy new year. 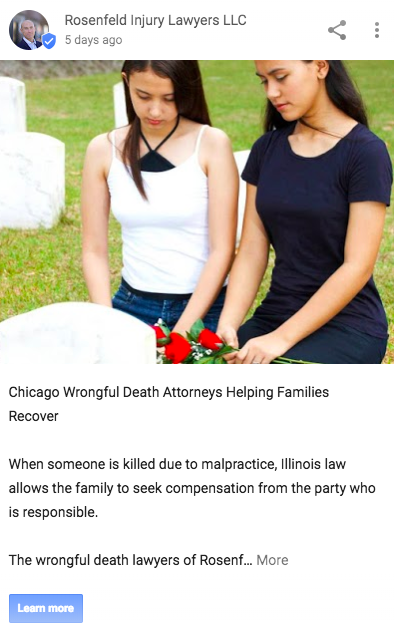 This law firm posted on GMB about local news. 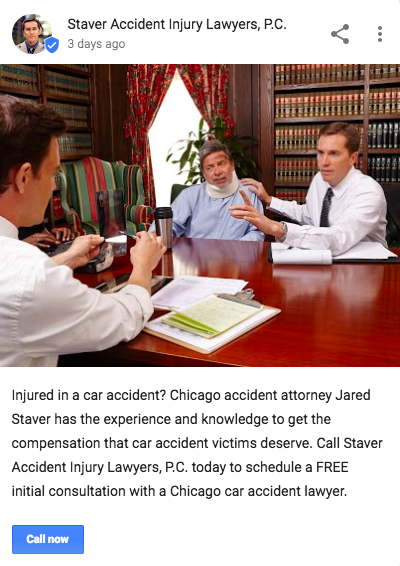 This law office is showcasing their work in the personal injury niche. 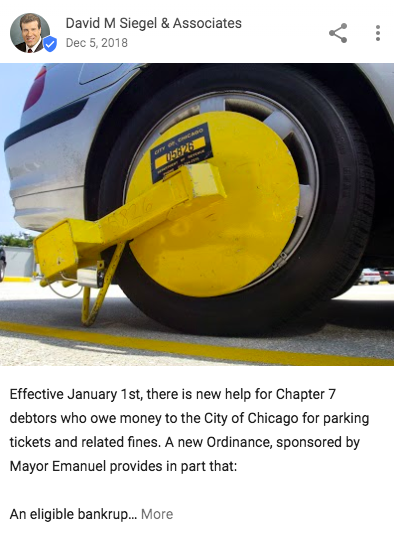 This lawyer posted on Google My Business about a recent new ordinance. 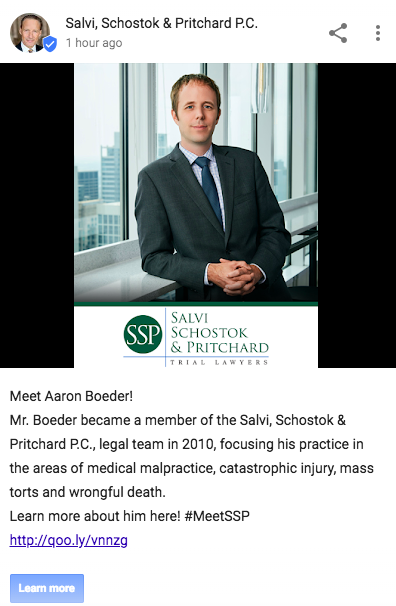 This attorney is using a GMB post to showcase his expertise in wrongful death lawsuits. 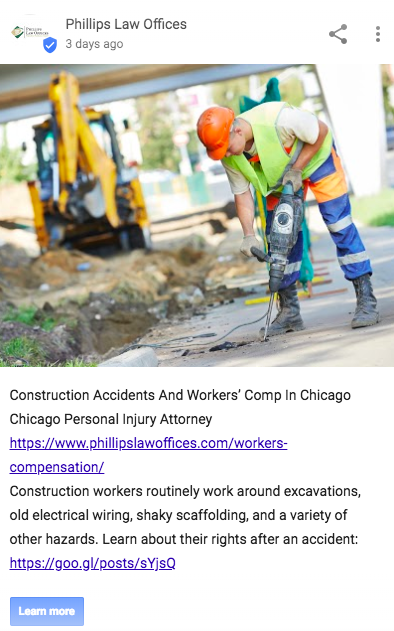 This law firm uses Google My Business posts to introduce new team members. 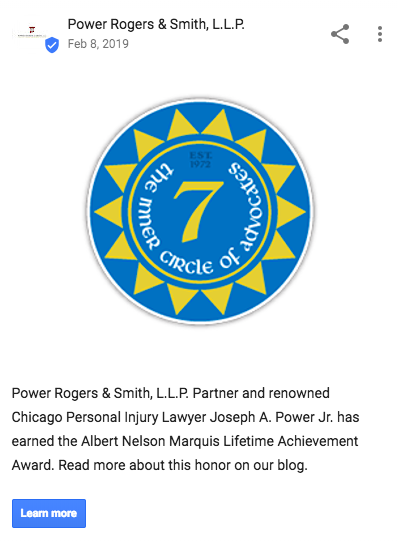 This law firm used a GMB post to announce an award they had recently won. 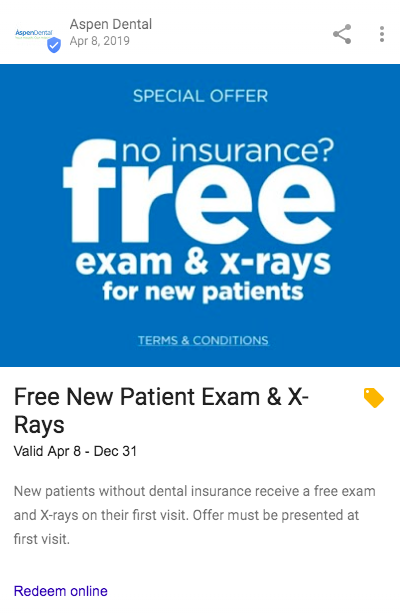 This Dental practice used a Google My Business post to promote free patient exams and x-rays. 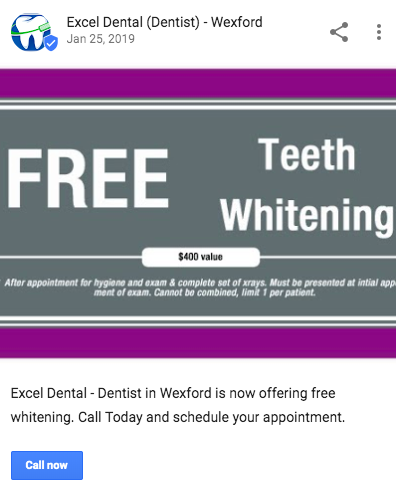 This is a Google My Business post example of a dentistry offering free teeth whitening with a Call now CTA button. 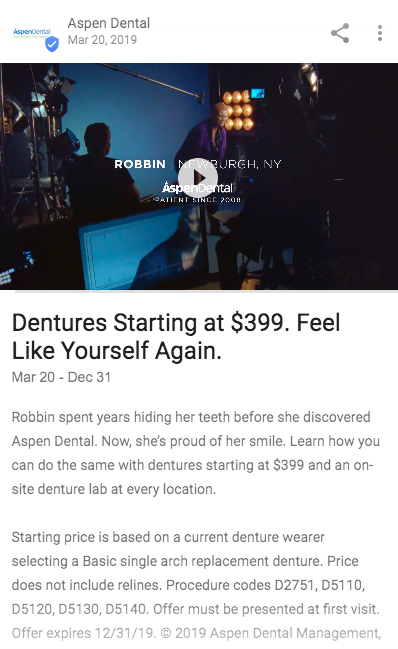 This dentist used a Google My Business video post to advertise dentures. 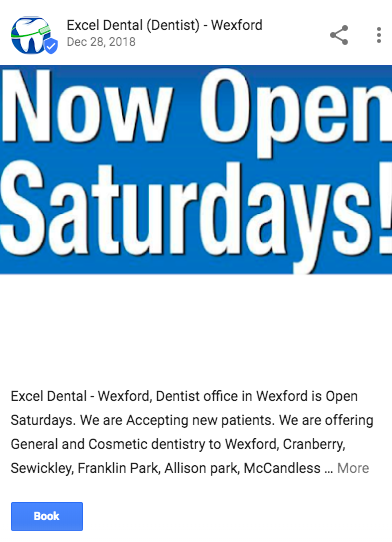 This is a Google My Business post example of a dentistry announcing its new office hours. Need an easy way to schedule and automatically repeat Google My Business posts? OneUp allows you to schedule and set your Google My Business posts to automatically repeat. The best part is it’s only $4/month for up to 3 accounts. 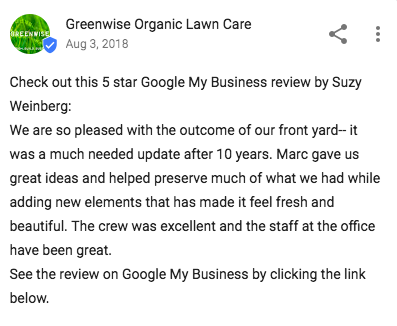 Does AgoraPulse support Google My Business posts? AgoraPulse does not support Google My Business. AgoraPulse does not support Google My Business. However, OneUp supports Google My Business, in addition to Facebook, Instagram, Pinterest, Twitter, and LinkedIn. 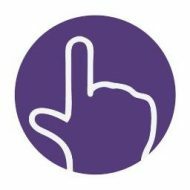 OneUp has a 7-day free trial and is only $3/month for up to 10 accounts. Posted byDavis Baer February 26, 2019 March 6, 2019 Posted inGoogle My BusinessTags: Google My Business, Google My Business schedulerLeave a comment on Does AgoraPulse support Google My Business posts?